With reference to the latest market forecast report published by Transparency Market Research, titled 'Nutrition Bars Market: Global Industry Analysis and Opportunity Assessment 2018-2026', revenue generated from the global nutrition bars market has been estimated to be valued around US$ 1,613.6 Mn in 2018, which is estimated to increase at a CAGR of 4.1% to US$ 2,231.1 Mn by 2026. The global nutrition bars market is segmented on the basis of product type, format, function, packaging, nature, sales channel, and region. On the basis of product type, the global nutrition bars market is categorized into protein-rich bars, energy bars, meal replacement bars, and low carbohydrate bars. 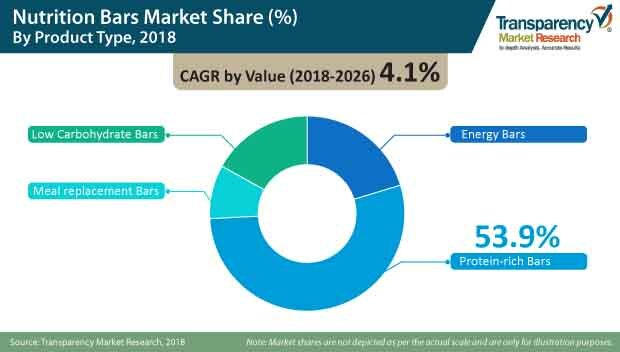 The protein-rich bars segment is anticipated to have a prominent market share of 53.9% in the year 2018, followed by the energy bars segment. On the basis of format, the market is segmented into extruded, co-extruded, double layer, and multilayer. The double layer nutrition bars segment is expected to dominate the format segment with a market share of 43.8% in the year 2018. This segment is expected to have a greater market share over the forecast period, due to the attractive composition and reduction in retail prices, supported by the cost-effective production of the same using new food technologies. On the basis of function, the nutrition bars market is divided into weight management, sports & fitness, functional food (diabetes, others), and others. The sports & fitness segment is expected to dominate the function segment of the market with more than 50% of the market share in the year 2018. On the basis of nature, the nutrition bars market is divided into organic and conventional. The conventional segment is expected to completely dominate over the organic nutrition bars. However, the organic nutrition bars segment is anticipated to have strong growth prospects over the forecast period, owing to the growing consumer preference towards organic and natural products, due to increasing health and wellness awareness among consumers. The nutrition bars market has been segmented into North America, Asia Pacific (APAC), Europe, Latin America, and the Middle East & Africa (MEA). The market in North America is expected to have a maximum market share of 47.8% in the year 2018, attributed to changing consumer eating habits, due to growing health and wellness consciousness among them. Consumers are well-aware about the products that they are consuming and their impact on their heath, and thus, they tend to buy products that are not only flavorful but also have health benefiting attributes. Nutrition bars are healthy bars that tend to provide fibers, proteins, and energy to the body, and hence, are gaining the attention of health conscious consumers. Besides, North America is also witnessing the growing demand for nutrition bars, owing to the growing snacking trend and increasing demand for convenience food in the region. However, the Asia Pacific region is anticipated to offer maximum growth opportunities to the nutrition bars market, with an expected CAGR of 5.2% over the forecast years, owing to increasing urbanization, growing per capita disposable income of consumers, improving standards of living, and growing health and wellness awareness among consumers, all of which are anticipated to drive the growth of the nutrition bars market in the region. Transparency Market Research has outlined the most important companies that are players in the global nutrition bars market, such as Glanbia Plc., Nutrition & Santé SAS, Artenay Bars, SAS, B.V. Vurense Snack Industrie, SternLife GmbH & Co. KG, Atlantic Grupa D.D., Halo Foods Ltd., anona GmbH, Prinsen Food Group B.V., Bedouin S.A.S, Viba Sweets GmbH, Leader Foods OY, and Frankonia Schokoladenwerke GmbH. Manufacturers of nutrition bars are emphasizing on product innovation, upgraded technology, and smart labelling to gain traction over the forecast period. A majority of manufacturers are now emphasizing on fragmenting out their offerings to reduce competitive friction in the mainstream nutrition bars market. For this, heavy investments have been noticed in equipment and ingredient composition to create a unique identity of the product on the overcrowded shelves. Manufacturers are now pushing their nutrition bars into the market through unorthodox sales channels such as clubs, gyms, and other institutions, to directly target their product towards the core users. Besides, contract manufacturers are expected to witness a growth in the demand for nutrition bars, as new players are playing safe by bypassing equipment and raw material cost for nutrition bar production. Detailed labeling of nutrition bars is expected to help manufacturers stand out in the crowded nutrition bars segment. Labeling such as '70% organic' is expected to catch more hits, as consumers know the real amount of organic products that they are going to consume per unit, creating trust for the product, and helping to create a strong brand equity for nutrition bars.